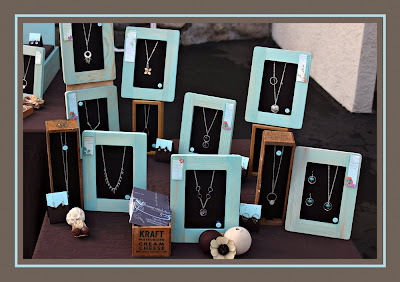 As you all know, I've been obsessed with creating my display for craft shows. See Parts 1, 2, and 3 if you doubt me. 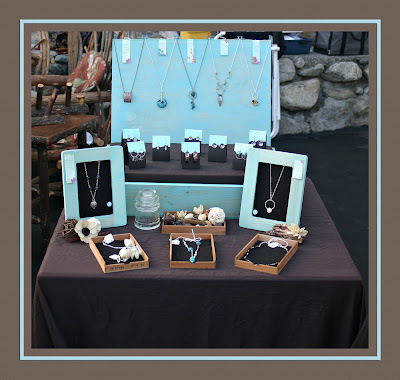 Well this Sunday I put the display to the test at the Rose Bowl Flea Market/ Arts and Craft show and it was a success. 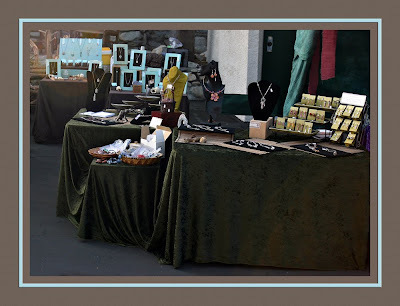 I got several compliments on the display from other vendors and Christine of Chocolate and Steel said the colors really popped. I really value her opinion so that made me happy. I think the only things you haven't seen are Table 2 and any of my work on the displays, so lets start there. Here's table 2. I'll be tweaking it a little but I'm mostly happish. And Here's table 1 all dressed up with my work. And last, but not least, here's how are booth looked all together. I'm so excited. Now, full disclosure, before the SD show I did buy a cool sign for $25.00. And I bought a vintage box for $8.00 to turn into a cash register, which I will show you soon. So at the moment I have $73.00 invested in my booth. But I think I have done a good job not braking the bank for this part of my new business. And although the frames may be an obvious choice, I really like the way the whole thing has turned out. Tell me what you think of the final product. I would love to here your thoughts.